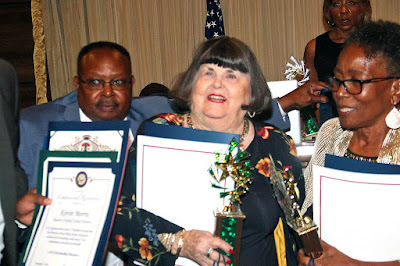 Joanne Montgomery, vice president of the Citrus Community College District Board of Trustees, who represents Monrovia on the board, was recently awarded the Outstanding Educator Award at the 26th annual Monrovia Duarte Black Alumni Association Gala. MDBAA President Larry Spicer said, "Educators such as Joanne Montgomery influenced thousands of people throughout Monrovia and Duarte,"
Montgomery taught in the Monrovia Unified School District and the Duarte Unified School District for 32 years. She said, "I really cared about my students. I saw each one as a success and enjoyed providing extra tutoring time or whatever else they needed to achieve their goals. I am truly honored to have received this award from some of my former students, so many years later."